They are falling like domino pieces. Call it “network effect” or call it the comfort of a peer, but whatever it is, the world is waking up and protests only at the 90th minute. That’s better than nothing at all. We are already aware of four formal appeals against OOXML, but as we stressed before, there might be more coming, assuming that something was misunderstood, someone was misinformed, or the process delayed without (or due to) unexpected disruption. The person whose word you can count on the most at this stage is Andy Updegrove. 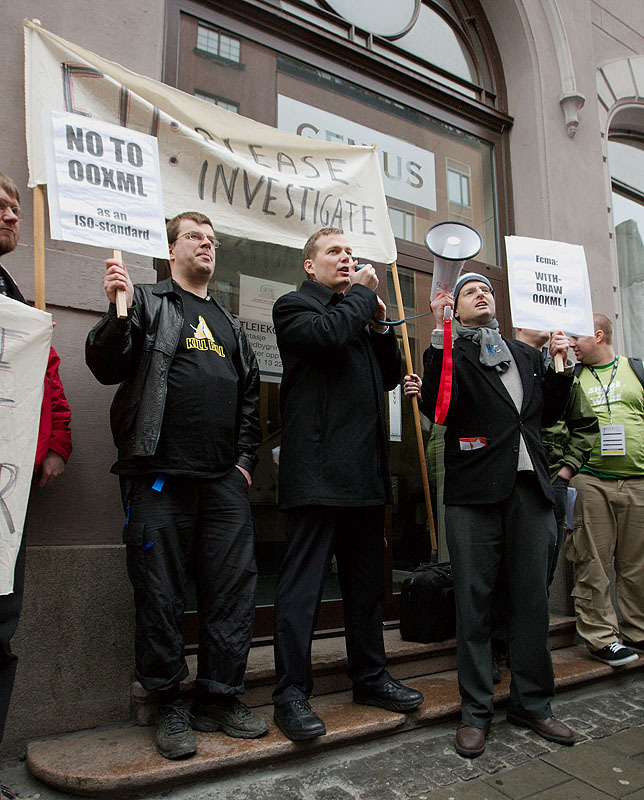 Earlier today, on a couple of occasions in fact, we mentioned Denmark’s role in the latest wave of backlash against OOXML. There is some more analysis at Linux Journal, whose editor took a look at Groklaw (and the ongoing discussion/translation phase), as well. So far, South Africa and Brazil have lodged formal appeals with the ISO, while several other countries are battling it out against their national standards bodies via their national governments. Jacob Holmblad — the Dansk Standard Director/ISO Vice President — told Computerworld that he will be in Geneva next week, and expects to see the issue addressed while he is there. Something tells us, however, that it will be a long, long time before we finally see the OOXML debacle truly addressed. So, do we have an appeal, as we cautiously suspected when a complaint came from Venezula and then confirmed as a substantiated appeal? We shall find out pretty soon. The German standards institute, the Deutsches Institut für Normung (DIN), which despite reported voting irregularities, voted for OOXML, has yet to form its opinion on the appeals. A spokesperson told heise online that a majority of the steering committee of the IT and Applications Standardisation Committee (NIA) has recognised that there has been a serious breach of JTC 1 and ISO rules. He stated that this is also the position of the DIN as a whole. At the same time, however, the conclusion has been reached that the rules for the fast-track procedure need to be amended, as documents of the scope of ISO/IEC 29500 can hardly be dealt with within the current framework. According to the spokesperson, the DIN has initiated corresponding discussions in Geneva. This means that Germany’s involvement in this revolt might be something to watch. It’s the largest population in Europe, is it not? A spokesperson told heise online that a majority of the steering committee of the IT and Applications Standardisation Committee (NIA) has recognised that there has been no serious breach of JTC 1 and ISO rules. He stated that this is also the position of the DIN as a whole. Your quote about DIN is wrong! Oh dear. I copied and pasted that. They possibly amended the text in Heise. I’ll check. I would have been pleasantly surprised if they had done that, since they voted to “Approve” OOXML. Instead, it’s from the Danish Open Source Leverandørforeningen group — not the same thing as thw national standards body itself. Still, it’s better than nothing.